Tom Venuto is a larger than life kind of guy - almost kinda literally as he most assuredly walks (and lifts) his talk. I had the pleasure of meeting Tom the last time I was in New York, and I was impressed by his passion and his knowledge - not just on training, but on health and nutrition as a whole. We originally "met" via Twitter 4 or 5 years ago, and not being involved at all in lifting or the training community at the time (my loss as I've since learned it's a vibrant and incredibly supportive and engaged one), I wasn't familiar with Tom's motivational empire. His websites, Burn the Fat Inner Circle and his Burn the Fat Blog have huge followings - and I can tell you, huge followings in the training community aren't built off of hype, they're built off of trust, knowledge and integrity, qualities Tom has in spades. 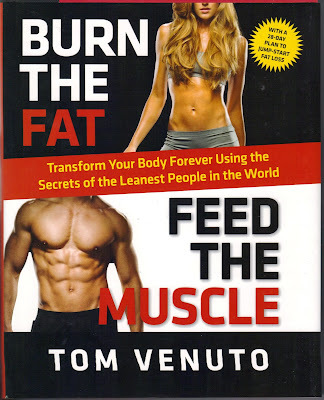 Being basically a toddler in weight lifting myself, and keen to read Tom's Burn the Fat, Feed the Muscle (the original e-book of which has sold over 250,000 copies), I was excited when asked if I'd be interested in receiving a copy of his first ever hardcopy edition. Up front I'll tell you that Tom and I have one distinct philosophical difference. Tom loves number goals. Whether they're body fat percentiles, pounds on a scale, or other performance based metrics, Tom wants you to pick one, take aim, and with the help of the program he lays out, nail it. Me? I think I come at this having never been a physical competitor, and I think therein might lie the basis of our difference. You see I am, and always have been, painfully uncoordinated. I would get picked last even after injured kids when teams were picked in school. Even today, though I'm certainly fit, I'm not what anyone would call athletic, and when I run triathlons I generally place, even with my best efforts, in the bottom 30-40th percentile. I have had to learn to value my personal bests as great and not get caught up in whether or not I hit some particular number - as my friend and author of The Flex Diet Jamie Beckerman says, for me, "the road is the goal". Consequently in all of my endeavours and teachings, I try to help people shift their focus away from wanting to reach a particular body fat percentile or number on a scale and instead focus them on the behaviours they truly have control over - on the stuff they'll need to do in order to have a hope of hitting those number goals. To put this another way, yes an A+ is the best grade you can get in school, but really as a student you can't guarantee one, all you really have control over is whether or not you go to class, do your homework, and how much you study. And if you really want to try to hit that A+ then you might decide to hire a tutor or join a study group. And if you're looking to cultivate a gym-inspired, health-focused lifestyle - well then Burn the Fat, Feed the Muscle may well serve as your ace-in-the-hole tutor. "If you want to see a real miracle, try training hard and eating real food consistently for a few months." Tom is all about you pushing your limits, and in fact I think it might be safe to say (he can correct me if I'm wrong), that he wants you to rid yourself of the notion that you have any. I do agree with him in that on the one hand, you can force yourself to attain any weight, body fat percentile or clothing size that you might want, but my experiences, albeit with a very different patient base, is that if suffering is a prerequisite to reaching your goal, than suffering is likely also a prerequisite for staying there, and while no doubt the human spirit can overcome it, it can usually only white-knuckle its way through those limits temporarily. I wish there were such things, but in healthy living efforts, there are no finish lines - the race keeps going, and if you've ever run before, you know that sprinting might indeed get you to a finish line faster, but if that finish line is no where in sight, sprinting's probably not a great race plan. Burn the Fat, Feed the Muscle provides personalizable templates both for diet and training where the basis of each come from a mix of what works (the experience of Tom as both a champion body builder and the lessons he's learned during his decades of training, teaching and competing) and best evidence. It's a great mix as sometimes what an expert knows works, isn't supported by a study - and herein is why if you're looking for lifestyle advice, it's best to get it from someone who truly works with people - rather than from a researcher or writer who presents their theoretical though evidence based viewpoints, as the application of the evidence base doesn't always mesh with the realities in the trenches, and as mentioned, sometimes what's working in the trenches has yet to be proven in the ivory towers. Reading his sections on nutrition, there's no doubt Tom gets it. From even the preface Tom hammers home the truly crucial fact that its kitchens that matter more than gyms when it comes to weight. His dietary recommendations and his discussion of macronutrients and nutrition in general echo those of my own and aren't stuck in any particular one-size-fits all mantra. They provide a great foundation of what someone hoping to simultaneously lose weight and build/preserve muscle would need and all without cutting calories out at your knees. Going through his training sections, whether your a beginner, an intermediate or an expert, there'll be something here for you and I think in reading them I'm going to follow Tom's recommended "periodization cycle" designed to get the most out of my lifting. At the end of the day I have zero doubt that if you follow Tom's advice, you're going to dramatically change your health, your weight and your body. If you're the type who thrives on goal setting and numbers - this might very well be your healthy living bible and really the perfect New Year's Resolution tome. If you're a bit more like me, more comfortable with the goal of doing your best and moreover comfortable with the fact that your best might not be as good as someone else's best, the only thing you might want to consider going in is that it might be safer to use the various numerical metrics as means to track your progress - using them (as Tom also recommends) as a means to troubleshoot the impact of changes to your strategies, rather than as a means to determine if you've succeeded. Want a copy? Here's an Amazon Associates link.